The bills are stacking up, and Mia Galdon’s tenth interview has just been a repeat of the nine that preceded it since she lost her job in a hospital merger. Despite a much hyped shortage of nurses, no one seems to be hiring RNs in the current economy. Mia is particularly concerned about what will happen to her younger sister Ginny if Mia can no longer bear the expense of keeping the teen with Down syndrome in the private school where she is thriving. Just when Mia’s spirits are at their lowest, she receives a request to call Lacey Covington, a voice from the past, a past that Mia has spent a decade trying to forget. With her instincts telling her to avoid all Covingtons, Mia still finds it impossible to ignore the call. She can’t believe it when Lacey offers her a job. Lacey knows where Mia is most vulnerable. She promises to set up a trust for Ginny that will pay tuition for the two years Ginny can remain at school and provide for Ginny for the rest of her life if Mia will agree to take on the job of private nurse to Lacey’s brother, Cole Covington. Cole Covington was the only survivor when the Humvee in which he was a passenger drove over an improvised explosive device in Iraq. Retreating to his Wilmington Beach, North Carolina estate after the Army gives him an honorable medical discharge after months in hospitals, including four weeks in a medically induced coma, Cole isolates himself, refusing to see anyone and firing every physical therapist and nurse that Lacey hires. He accepts only the basic help provided by Rose Wendler, the Covingtons’ former maid. Scarred in mind and body, tormented by nightmares and panic attacks, and suffering from a depression so severe that he rarely bothers to shower or shave or to take the medication his doctors have prescribed, Cole punishes himself by refusing anything that will lessen his physical and psychic pain. He does his best to drive Mia away too, but having taken on the job, Mia refuses to give up. Mia and Cole have a history. Even though Mia was “trailer trash,” the daughter of an alcoholic mother who occasionally worked as a domestic servant in the Covingtons’ summer home, and Cole was the privileged younger son of a wealthy and prominent Charlotte family, the two became friends and, briefly, more than friends. But the love that seemed magical ended in betrayal, tragedy, and humiliation. Neither Mia nor Cole has forgotten what they once shared, and now that they are spending time together, it doesn’t take long for old dreams to revive. But Cole has secrets he has been protecting for ten years, and Mia—regardless of her hard-earned accomplishments—still can’t forget the social chasm that once existed between her and Cole. Can they overcome these obstacles and relentless efforts to keep them apart to claim their happiness? In this first book in a promising new series, Moran offers readers a moving, intense story of reunited lovers. A series of flashbacks reveals the events that drew Mia and Cole together and then split them asunder, and in the present Mia’s tough love helps Cole heal physically and psychologically and Cole’s truths heal wounds Mia has ignored. The leads are both sympathetic characters, and secondary characters including Mia’s sister and Cole’s sister are also engaging. The reader wants to see all of them achieve a deserved happiness. My only complaint is that the villain of the piece is a one-dimensional character, a Bad Mother who is an arrant snob without an iota of compassion or self-awareness. I would like to have seen more complexity in this character. But this disappointment was not enough to prevent my enjoying the book. 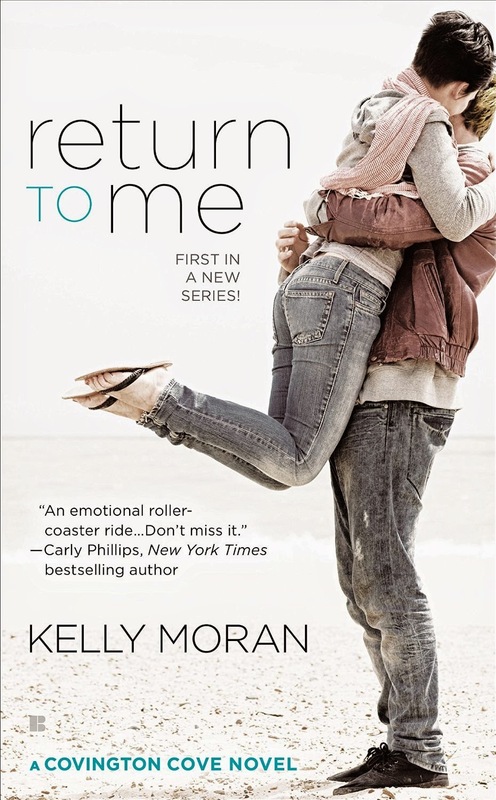 Return to Me is a poignant story, one that repeatedly tugs at the heartstrings. I particularly liked the fact that both the hero and heroine are agents in creating their eventual happiness rather than one or both being mere recipients of a happy conclusion. This was my first book by this author, but I will definitely keep an eye out for other books in this series. This author is new to me. Am adding it to my list. I like the sound of this one. Adding it to my list. Thanks, Janga! New to Me too. Will check her out. I've got this at the top of my reading pile - looking forward to it! In what sounds like a well written book, it is a shame the mother character wasn't developed more, especially because of her place in the story line. Maybe she will be filled out more in future books in the series.